StarForce 3.5.10.6 DRM (removed by installing the X³ Reunion 2.5: Uplink patch). The original OS X release was Cider-based, a later port made it native Cocoa code. 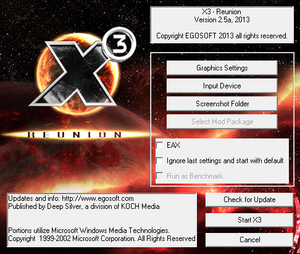 X³ Reunion 2.5: Uplink updates the game to the latest version and removes the DRM. 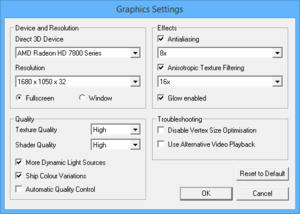 Automatically calculated based on the resolution; can't be changed. 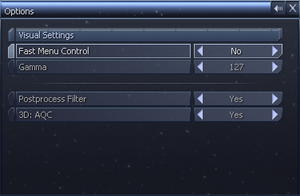 Only means of controlling FOV is a temporary zoom effect. Can't move window without external utility. In-game cursor is slightly slower than normal Windows. Some menus don't allow backing out. 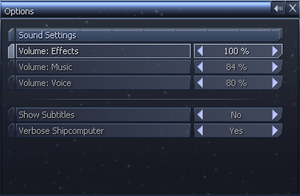 Serial used for registering on Steam. DRM is removed by installing the X³ Reunion 2.5: Uplink patch. 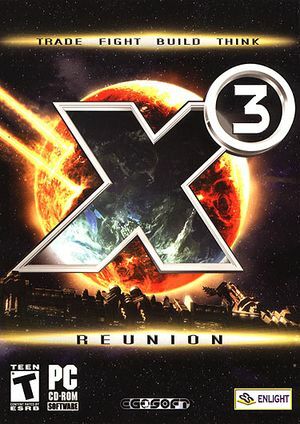 Install the X³ Reunion 2.5: Uplink patch. 9 Windows and Cider OS X only. 2.0 Native OS X and Linux only.